ARE WE IN FOR AN IRON AGE SUMMER ? The Somerton excavation is still at the planning stage but is expected to take place soon. It will be based on the earlier speculative test trenches dug as part of the planning process for development at the BAE Systems plant. The test excavations covered only 3% of the site but revealed part of a probable iron age roundhouse and the suggestion of a typical associated four-post granary. This opens up the prospect of a complete farm settlement, although it's not clear how much of this could be exposed. The extent of excavation is still under discussion but it is hoped its area will be sufficient to cover all potential features. At Brading the third 'Big Dig' in the present series will cover a 30m x 30m field at the villa site. Unlike the previous digs, this area was not subject to 19th century excavation and its promise is based on more recent discoveries and analysis. When the car park was laid in 1997 a number of late Iron Age/early Roman features were revealed. Since 1994 English Heritage have been carrying out regular geophysical surveys on the land surrounding the villa. The results show numerous anomalies indicating track-ways, enclosures or field boundaries. It is thought the Roman Villa could represent the continuation of a major Iron Age farm settlement. There is no doubt the Island's late Iron Age people were regularly trading for Roman goods, although we don't know how close their relationship was with continental traders. Nor do we know whether they regularly crossed the channel or were simply passive importers. Some have speculated that parts of the Island may have seen the eventual Roman occupation as more of a consolidation than a conquest. Villa conducted by English Heritage, showing numerous linear features. There was a time when there were numerous farm limekilns across the Island. In recent years local industrial archaeology enthusiasts have been searching the various remains to see if at least one could be salvaged for conservation and permanent display. A once barely visible limekiln at Mersley has now been excavated and it looks like an ideal candidate. The Mersley limekiln had been filled in and virtually buried, initially suggesting that root damage may have rendered it beyond recovery. When an inspection revealed it might in reasonable condition, the IW Industrial Archaeology Society obtained permission from landowner Colin Boswell for a complete excavation. After two days of intensive mechanical excavation the structure was revealed as having considerable potential. Since then further work has brought the site closer to its original state, although there is still much to be done. Once the structure was exposed it emerged that there were in fact two separate kilns. An earlier stone built version subsequently had a brick built kiln added to it. The resulting twin pot arrangement was probably unique. Research suggests the first kiln was established around the mid 19th century. There is anecdotal evidence that the site was still producing until the mid 20th century. Once the industrial limekiln complex at Brading had closed down, the Mersley farm kiln may have been the last Island source of quicklime. As such it probably provided for some building mortar as well as farm lime spreading. There are stories of horse and cart deliveries as far as Yarmouth. The demands of the Napoleonic Wars created a significant rise in grain prices and the shift in farming practice resulted in a dramatic increase in lime spreading. By the early 19th century many farms had their own limekiln. It is perhaps surprising there are so few remains in an area dominated by agriculture. A previous attempt to salvage a limekiln on National Trust land at Mottistone failed when NT ultimately refused permission. The Mersley excavation will probably be the last opportunity to preserve and display this essential feature of our agricultural past. It took two days of mechanical excavation to expose the buried limekiln, and work continues. As anticipated, the third dig on the Roman Villa site has produced evidence of a major Iron Age occupation, including significant finds of imported Mediterranean goods. The potential size and status of this site prompts speculation about organisation behind the trade in these goods. The director of excavations, Sir Barry Cunliffe, takes the view that the late Iron Age/Early Roman finds verify the theory that the Brading site was a high status Iron Age farm settlement that eventually evolved into what might be regarded as its Roman equivalent. There is no reason to assume the dig hit on the key part of the settlement, so there could be more intense Iron Age archaeology elsewhere. The evidence suggests a fairly worldly operation, at least by Isle of Wight standards, and it raises some questions about the organisation and distribution surrounding trade during the pre-Roman period. 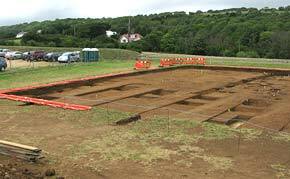 Other more modest Island sites have produced evidence of Roman imports during the late Iron Age. Up until now it seems to have been generally assumed these coastal and riverside sites have mainly been importing directly from the continent. On reflection this arrangement might seem impractical for what may have been relatively small quantities, either for traders delivering to the Island or for locals journeying to the continent. It has been suggested that perhaps some goods may have been distributed from south coast mainland centres. But why not more common distribution from one or two Island centres? The Island is on the main shipping routes and it would have made sense to establish particular hubs where traders could concentrate the exchange of goods, allowing distribution thereafter to be dealt with locally. Could the Brading pre-Roman site have been just such a centre? Iron Age Wight may have been something of a backwater but the Brading site suggests there were a few relatively advanced operators, albeit not necessarily native Islanders. The farm would have already been shipping its own produce; why not that of smaller farms, including an exchange for goods? It would only require modest boats to distribute between Brading and east Island settlements via coast or river. Much of the claimed evidence for direct continental trading comes from offshore finds, but these would also arise from local traffic. Of course, it's only too easy to take the commercial practices of recorded history and apply them to prehistory. On the other hand, there is no reason to assume the practicalities of trade arose at the point of recorded history. Either way, it's no more than speculation.